The Green Men in Vancouver brought some Eggos last night. 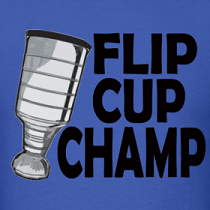 Decent night in the NHL last night. Eric Staal got a natural hat trick, Eric Boulton somehow scored three goals, and I witnessed a drunk twenty-something-year-old buy a Justin Pogge Toronto Marlies jersey off a 45 year old woman with a buzzcut for $30. Fun night. 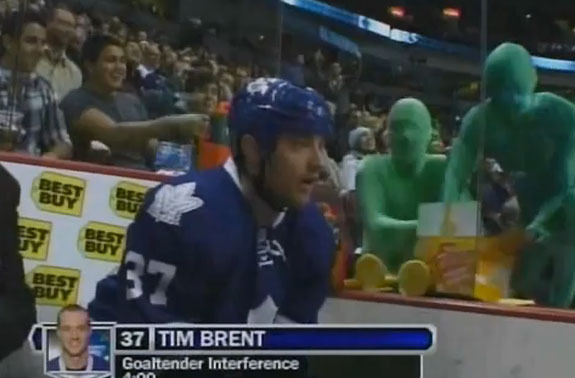 Leafs lose to the Powerhouse Canucks, get mocked by Green Men. Should the Canucks retire Pavel Bure’s number? "Is it wrong to like the cartoon babe? " No it's not, I think some people are into that. I think gretzky talked up kyle turris a little too much...but that was a really nice shot.